Updated: Barquin Arozamena missed the cut at the U.S. Women’s Open, with a 76-75. Complete results here. Civil Engineering’s own Celia Barquin Arozamena, Big 12 champion and three-time All-Big 12 golfer, is headed to the U.S. Women’s Open. A native of Puente San Miguel, Spain, Barquin Arozamena fired a final-round 66 and won a two-person playoff for the final spot at the U.S. Women’s Open Sectional Qualifier at the Stillwater Country Club this afternoon (May 14). Barquin Arozamena appeared to be out of the running after opening the qualifier with a 78. However, she bounced back with a 6-under 66 today, including a scorching 5-under 31 on the back nine. 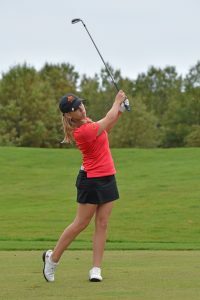 The Cyclone star joins Shelley Finnestad and Beth Bader as the only Cyclones to compete at the nation’s most presitgious women’s golfing event.